Watch our video to learn how to cook Crispy Parmesan Baked Potatoes with just four ingredients! 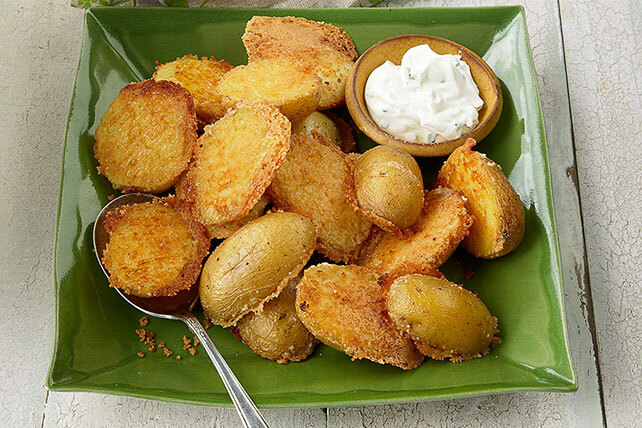 The kids will love this Parmesan baked potato side dish. Combine cheese and garlic powder in shallow dish. Dip cut-sides of potatoes in butter, then in cheese mixture. Place, cheese sides down, on baking sheet; drizzle with any remaining butter. Serve with 3/4 cup BREAKSTONE'S or KNUDSEN Sour Cream mixed with 2 Tbsp. chopped fresh chives. After testing a variety of potatoes for this recipe, we found 2-inch Yukon gold potatoes worked best. Do not cover the baking sheet with foil since the cheese mixture will stick to it.